They don’t call us the “Art Coast” of Michigan for nothing. Our beautiful town on the shores of Lake Michigan has been attracting artists and art lovers for over one hundred years. From the working artists who helped to build a thriving creative community to the art-loving tourists who come to browse our world-class galleries, the art scene in Saugatuck, Douglas, and Fennville is truly hard to beat. Saugatuck’s history as a mecca for artists and creative types dates back to the creation of the Ox-Bow School of Arts and Artist Residency in 1910. Ox-Bow has been in operation for over a century, offering a wide range of opportunities for artists at all stages of their career. Their year-round programs cater to degree-seeking students, professional artists, or beginners looking to build their skills and try something new. Its rural isolation, tranquil natural beauty, and rich history has helped to make Ox-Bow one of the best artist and writer residency programs in the nation. In addition, their renowned fellowships, classes, and events have helped to make Ox-Bow an essential and beloved bastion of the local arts community. Saugatuck Center for the Arts is considered by many to be the beating heart of the local arts scene. Their focus is on the “intersection of art, community, and joy.” In addition to the incredible art exhibitions and installations at their lakeside gallery, SCA host theater performances and world-class concerts and screen a variety of films, including documentaries, indie films, and art house pictures.This summer theater season will include classic stage shows like In the Heights, Unnecessary Farce, and A Gentleman’s Guide to Love and Murder. During the summer months, the Saugatuck-Douglas Art Club hosts two large outdoor art fairs, scheduled for the 4th of July and the last Saturday of July. Spend a beautiful summer afternoon strolling through a wide variety of booths and vendors selling all sorts of arts & crafts. This is a great way to support local artists and immerse yourself in Southwest Michigan’s unparalleled artistic community. Another great event is Art on Center in Douglas, a fun evening where participating galleries open up their doors to the public for receptions, art demonstrations, and exhibitions of new work. For a full list of galleries in the region, please visit Saugatuck’s art gallery directory. 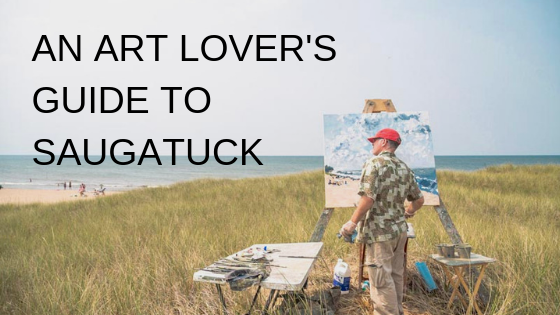 Planning an artistic getaway to beautiful Saugatuck, Michigan? Book a stay at the charming Twin Oaks Inn Bed & Breakfast, located just minutes from downtown Saugatuck and the shores of Lake Michigan!